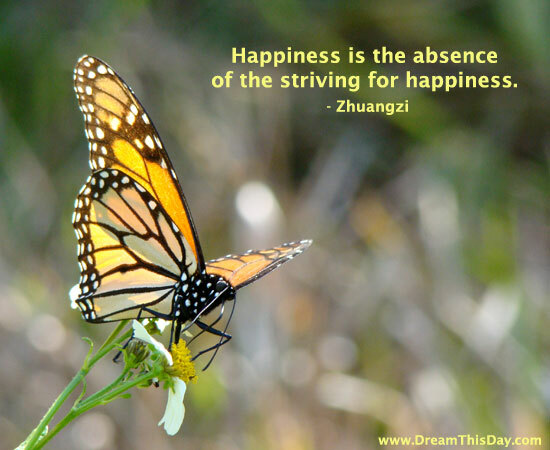 Happiness can be elusive - if you "pursue" happiness, you will never find it. However, being happy is within everyone's grasp. Some of the crucial keys to living a joyful life are establishing a life purpose, being of service to others, and maintaining a positive attitude. You can read more in my article The Secret of Happiness. Please sign-up for my Free Email on the form below. The word "happiness" would lose its meaning if it were not balanced by sadness. You're only here for a short visit. Don't hurry. Don't worry. What is happiness except the simple harmony between a man and the life he leads? Be content with what you have, rejoice in the way things are. and act upbeat until the happy feeling becomes genuine. Know that your own life is of infinite importance, as is every other life. Our happiness or misery depends on our dispositions and not on our circumstances. Happiness is knowing you don't have to be "perfect," you can just be yourself. Happiness lies in accepting everyone in our lives EXACTLY as they are. whenever we believe others to be imperfect and try to change them. The path to happiness is to live your life joyfully in your own way and to support and encourage others to do likewise. See more quotes and sayings.